3/8/13 by Jennifer Schuessler- For decades, it has been one of the most politically charged questions in American history: What did Franklin D. Roosevelt do — or, more to the point, not do — in response to the Holocaust? The issue has spawned a large literary response, with books often bearing polemical titles like “The Abandonment of the Jews” or “Saving the Jews.” But in a new volume from Harvard University Press, two historians aim to set the matter straight with what they call both a neutral assessment of Roosevelt’s broader record on Jewish issues and a corrective to the popular view of it, which they say has become overly scathing. Such statements, backed up by footnotes to hundreds of primary documents (some cited here for the first time), are unlikely to satisfy Roosevelt’s fiercest critics. Even before the book’s March 19 release, the David S. Wyman Institute for Holocaust Studies, a research organization in Washington, has circulated a detailed rebuttal, as well as a rival book, “FDR and the Holocaust: A Breach of Faith,” zeroing in on what it characterizes as Roosevelt’s personal desire to limit Jewish immigration to the United States. But some leading Holocaust historians welcome “FDR and the Jews” for remaining dispassionate in a debate too often marked by anger and accusation. “FDR and the Jews” offers no dramatic revelations of the sort Mr. Breitman provided in 2009, when he and two other colleagues drew headlines with evidence, discovered in the papers of a former refugee commissioner for the League of Nations, that Roosevelt had personally pushed for a 1938 plan to relocate millions of threatened European Jews to sparsely populated areas of Latin America and Africa. But it does, the authors say, provide important new detail and context to that episode, as well as others that have long loomed large in the popular imagination. They pointed in particular to the fate of the 937 German Jewish refugees on the ocean liner St. Louis, who were turned away from Cuba in May 1939 and sent back to other European countries, where 254 died after war broke out. The episode, made famous in the 1974 novel“Voyage of the Damned” and a subsequent film, has come to seem emblematic of American callousness. There is simply no evidence, Mr. Breitman and Mr. Lichtman say, to support accounts that the United States Coast Guard was ordered to prevent the refugees from coming ashore in Florida. What’s more, they were turned away from Cuba, the authors argue, as part of a backlash against a previous influx of some 5,000 refugees to that country, who may have been admitted under the terms of a previously unknown deal between Roosevelt and the Cuban leader Fulgencio Batista, who got reduced tariffs for his nation’s sugar in return. The book notes that the St. Louis affair unfolded against a backdrop of intense isolationist and anti-immigrant sentiment in the United States while Roosevelt was preparing to press Congress to allow the sale of weapons to nations victimized by German aggression. Many people, the authors say, believe that Roosevelt refused to bomb the camp (an option, historians note, that became feasible only in May 1944, after 90 percent of Jewish victims of the Holocaust were already dead). But the book contends that there is no evidence that any such proposal came to him, though a number of Jewish leaders did meet with lower-level officials to plead for bombing. And while the authors call the objections raised by those officials “specious,” they maintain (echoing others) that bombing would not have significantly impeded the killing. By contrast, the book points to the War Refugee Board, established by Roosevelt in 1944, which they say may have helped save about 200,000 Jews — a number that, if even 50 percent accurate, they write, “compares well” with the number that might have been saved by bombing Auschwitz. Such claims are not convincing to Rafael Medoff, the founding director of the Wyman Institute, which is dedicated to furthering the research of Mr. Wyman, a former professor at the University of Massachusetts Amherst who is not directly involved in its day-to-day activities. In “A Breach of Faith” Mr. Medoff argues that Jewish immigration levels in the 1930s were largely below established quotas because of Roosevelt’s animus, not as a result of anti-immigrant and anti-Semitic sentiment in Congress and the State Department. 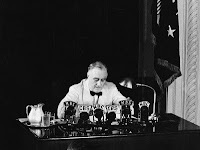 In the end, however, their verdict is favorable, crediting Roosevelt’s policies with helping to save hundreds of thousands of Jews, as well as preventing a German conquest of Egypt that would have doomed any future Jewish state. Mr. Lichtman pointed out that contemporary disagreements about Israel loom behind the Roosevelt debate today. Last year, the book notes, Prime Minister Benjamin Netanyahu of Israel cited America’s refusal to bomb Auschwitz as providing potential justification for a pre-emptive strike against Iran’s nuclear facilities. Henry L. Feingold, the author of “The Politics of Rescue: The Roosevelt Administration and the Holocaust, 1938-1945,” bemoaned the rise of “accusatory” history that elevates retrospective “what ifs” over historical context. Roosevelt, he said, had one overriding concern: to win the war.